Two separate “Ledges” waist packs (500 cubic inches at $99.99, and 650 cubic inches at$129.99) feature a suspended back panel with an aluminum stay, which adds support and keeps the packs from deforming, sliding, and feeling awkward. The “Overlook 500” ($99.99) Chest Pack is smartly designed to consider both width and depth in a way that slims the profile, yet still can carry a full supply for the river (or flats). This is a good option for the angler who shunned other chest packs because they feel like one’s wearing an accordion as they fish. “Overlook” is an appropriate name, because when you wear this, you can still see your feet. 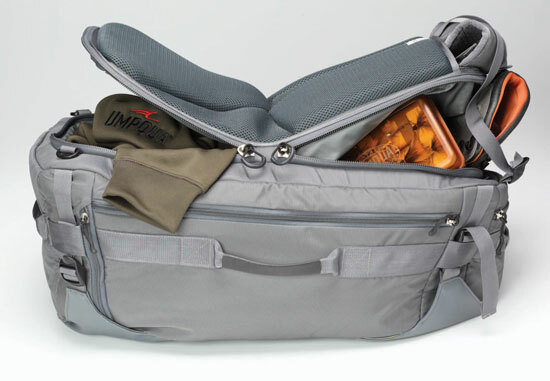 The “Famous” Boat Bag ($199.99) is all about ease of access. We especially like the large, functional zippers (and the cup holders where an oarsman can stash a beer). The “Deadline 3500” wet/dry duffle is just that… it has a membrane that can be used to separate wet gear from that which must remain dry (retail is $159.99); while the “Surveyor” Backpack ($179.99) also features a suspended back panel that helps keep you cool. They’ll all be available in January.